Drugs for Opioid Use Disorder | The Medical Letter, Inc.
Revised 3/1/18 & 9/13/18: Information on buprenorphine and naltrexone have been updated in the text and Table 1; Cassipa has been added to Table 1. Safety – The risk of methadone-associated mortality is highest in the first weeks after starting or stopping treatment.13 The drug accumulates during induction; it takes 4-7 days to achieve a stable dose. In overdosage, or if the dose is increased too rapidly during initiation of therapy, methadone can cause sedation and respiratory depression. The respiratory depressant effect of methadone peaks later and lasts longer than that of buprenorphine and other opioid agonists, and it persists longer than the analgesic effect of the drug. Drug Interactions – Methadone is a substrate of CYP3A4 and CYP2B6; inhibitors of these isozymes can increase serum concentrations of methadone, and inducers can reduce them.16 Concurrent use of methadone and other QT interval-prolonging drugs should be avoided if possible.14 As with any opioid, concomitant use of methadone with selective serotonin reuptake inhibitors (SSRIs), serotonin and norepinephrine reuptake inhibitors (SNRIs), tricyclic antidepressants, or other serotonergic drugs could result in serotonin syndrome. Concurrent use of methadone and benzodiazepines or other sedating drugs can result in additive CNS effects. For a more detailed table, click here. BUPRENORPHINE — Buprenorphine is a mu-opioid receptor partial agonist and kappa-opioid receptor antagonist. It is available alone and in combination with the opioid antagonist naloxone.19-22 Taken orally, naloxone is poorly absorbed and generally has no clinical effects; combining it with buprenorphine in sublingual or buccal formulations is intended to counteract intravenous or intranasal abuse. Administering buprenorphine via subdermal implant (Probuphine)22 or once-monthly extended-release subcutaneous injection (Sublocade)48 should reduce the risks of treatment nonadherence and drug diversion, but these formulations are more expensive than transmucosal buprenorphine. Sublocade has not been studied in active-controlled clinical trials. Safety – Even without naloxone, buprenorphine is safer than methadone because it has a ceiling on its respiratory depressant effect. As a partial agonist, it also has a lower abuse potential than methadone; the presence of naloxone may further reduce the abuse potential of buprenorphine products. Hepatic impairment reduces naloxone clearance to a greater extent than it does buprenorphine clearance. Use of fixed-dose buprenorphine/naloxone combinations in patients with severe hepatic impairment can lead to withdrawal symptoms when treatment is started and may decrease the efficacy of buprenorphine maintenance treatment. Drug Interactions – Concurrent use of benzodiazepines or other sedating drugs with opioids such as buprenorphine can result in additive effects. Buprenorphine is metabolized primarily by CYP3A4; concomitant use with a 3A4 inducer can decrease buprenorphine serum concentrations and use with a 3A4 inhibitor can increase them.16 Buprenorphine is a substrate of P-glycoprotein (Pgp); concomitant use with inhibitors of P-gp could increase buprenorphine serum concentrations. Use of an opioid with serotonergic drugs such as selective serotonin reuptake inhibitors (SSRIs) may result in serotonin syndrome, though the risk is lower with buprenorphine than it is with directly serotonergic opioids such as methadone. Buprenorphine may interfere with the analgesic efficacy of full opioid agonists. It should generally be discontinued 24-36 hours before elective surgery (except Cesarean section; stopping buprenorphine could cause fetal withdrawal). Dosage and Administration – Buprenorphine has a greater affinity for opioid receptors than full opioid agonists such as heroin and can displace them, causing opioid withdrawal. The risk of withdrawal can be reduced by not starting treatment until the patient is already experiencing mild-to-moderate opioid withdrawal (Clinical Opiate Withdrawal Scale score ~11-12)28 and by using a low initial dose of buprenorphine (2-4 mg of Suboxone, or equivalent). The daily dose should then be uptitrated, usually to at least 8 mg; most patients can readily achieve their target dose within 2-3 days. Higher doses (12-16 mg/day) should be considered if opioid misuse or abuse persists. Data supporting increased efficacy with doses >16 mg/day up to the maximum recommended dose of 24 mg/day are limited. Availability – Naltrexone is not a controlled substance, and there are no special restrictions on its prescription. Safety – Naltrexone is generally well tolerated. Adverse effects reported in opioid-dependent patients given IM naltrexone have included injection-site reactions, nasopharyngitis, insomnia, headache, nausea, and toothache. Depressed mood and suicidality have occurred rarely; a cause-and-effect relationship has not been established. Hepatic enzyme elevations and toxicity have been reported with use of naltrexone, but these findings occur frequently in opioid- and alcohol-dependent patients. Use of naltrexone can reduce tolerance to opioids; patients who relapse after receiving naltrexone may be at greater risk of a serious, potentially fatal opioid overdose. Drug Interactions – Naltrexone blocks the effects of usual doses of opioids, including opioid-derivative antidiarrheals and antitussives.34 It should not be used in patients taking an opioid for treatment of pain. Oral naltrexone should be discontinued 72 hours before and IM naltrexone 30 days before elective surgery. Dosage and Administration – Administration of naltrexone to a patient with physiological opioid dependence can precipitate a severe opioid withdrawal syndrome; patients should be free of dependence for at least 7 days before naltrexone is initiated. A naloxone challenge can be used to confirm the absence of physiological opioid dependence, but it is contraindicated in pregnant women because it can induce preterm labor or fetal distress. Vivitrol is supplied in single-use cartons containing a vial of microspheres, a diluent for suspension, needles, and a syringe. It should be given as a 380-mg IM gluteal injection in alternating buttocks every 4 weeks or once monthly. The dose pack should be stored in the refrigerator; if left unrefrigerated, it may be used for up to 7 days as long as it is not exposed to temperatures >77°F (25°C). Patients starting treatment with oral naltrexone should receive an initial dose of 25 mg. If withdrawal symptoms do not occur, they can then be given a maintenance dosage of 50 mg once daily. Combination buprenorphine/naloxone products are considered safe for use during pregnancy, but data on their efficacy in pregnant women are limited.43 Buprenorphine without naloxone is preferred. Data on the safety and efficacy of naltrexone use in pregnancy are limited. In general, women taking naltrexone who become pregnant and are at high risk for relapse can continue treatment. LACTATION — Use of methadone or buprenorphine monotherapy by breastfeeding women is generally considered safe. Women taking naltrexone should not breastfeed because the drug and its major metabolite can pass into breast milk to a clinically significant extent. Availability – A number of jurisdictions now have naloxone access laws that make the drug available to first responders and to relatives and close friends of persons using heroin or taking prescription opioids. These laws may also grant civil and criminal immunity to laypeople who carry or administer naloxone, to healthcare professionals who prescribe or dispense the drug to laypeople, and to persons who call emergency medical services in good faith to reverse an overdose. A regularly updated database of state naloxone access laws is available (http://lawatlas.org/datasets/laws-regulating-administration-of-naloxone). Pharmacology – Naloxone is a competitive mu-opioid receptor antagonist and has no opioid agonist effects. In opioid overdose, naloxone begins to reverse sedation, respiratory depression, and hypotension within 1-2 minutes after IV administration, 2-5 minutes after IM or SC administration, and 8-13 minutes after intranasal administration. The half-life of naloxone is much shorter than that of most opioids and repeated administration may be necessary, especially for overdose with a long-acting opioid agonist such as methadone or a sustained-release formulation of a short-acting agonist such as oxycodone. Pure heroin has a shorter half-life than naloxone (2-6 minutes), but heroin is a prodrug that is rapidly metabolized to 6-acetylmorphine and morphine. The risk of respiratory depression is related to those active metabolites, and it may persist well beyond the clearance of heroin from the blood. Other drugs used to "cut" heroin may have longer half-lives.46 If not already present, emergency medical services should always be called immediately after administration of naloxone. Adverse Effects – Whether naloxone itself has any toxicity is unclear, but it can precipitate acute withdrawal symptoms in opioid-dependent patients. Acute opioid withdrawal is associated with anxiety, piloerection, yawning, sneezing, rhinorrhea, nausea, vomiting, diarrhea, and abdominal or muscle cramps, which are uncomfortable but generally not life-threatening, except in neonates. In a pharmacokinetic study of intranasal naloxone (Narcan), the most common adverse effects were increased blood pressure, constipation, toothache, muscle spasms, musculoskeletal pain, headache, rhinalgia, xeroderma, and intranasal effects including dryness, edema, congestion, and inflammation. Pregnancy – No embryotoxic or teratogenic effects were observed in pregnant mice and rats treated with large doses of naloxone. Naloxone does cross the placenta, however, and may cause fetal opioid withdrawal or induce preterm labor. Centers for Disease Control and Prevention. Drug overdose death data. Available at: www.cdc.gov. Accessed May 25, 2017. American Society of Addiction Medicine. National practice guideline for the use of medications in the treatment of addiction involving opioid use. 2015. Available at: www. asam.org. Accessed May 25, 2017. Department of Veterans Affairs and Department of Defense. VA/DoD clinical practice guideline for the management of substance use disorders. 2015. Available at: www.healthquality.va.gov. Accessed May 25, 2017. MA Schuckit. Treatment of opioid-use disorders. N Engl J Med 2016; 375:357. British Columbia Ministry of Health. A guideline for the clinical management of opioid use disorder. Available at: www2.gov.bc.ca. Accessed May 25, 2017. Institute for Safe Medication Practices. Keeping patients safe from iatrogenic methadone overdoses. February 14, 2008. Available at: www.ismp.org. Accessed May 25, 2017. Substance Abuse and Mental Health Services Administration. Substance abuse treatment advisory. News for the treatment field. Emerging issues in the use of methadone. 2009. Available at: https://store.samhsa.gov. Accessed May 25, 2017. RP Mattick et al. Methadone maintenance therapy versus no opioid replacement therapy for opioid dependence. Cochrane Database Syst Rev 2009; 3:CD002209. F Faggiano et al. 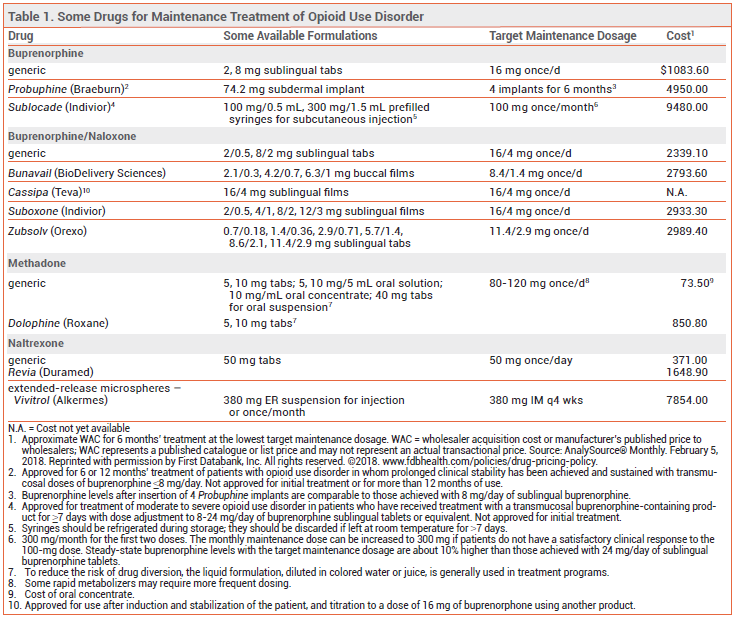 Methadone maintenance at different dosages for opioid dependence. Cochrane Database Syst Rev 2003; 3:CD002208. L Gowing et al. Oral substitution treatment of injecting opioid users for prevention of HIV infection. Cochrane Database Syst Rev 2011; 8:CD004145. S Nolan et al. The impact of methadone maintenance therapy on hepatitis C incidence among illicit drug users. Addiction 2014; 109:2053. L Lappalainen et al. Dose-response relationship between methadone dose and adherence to antiretroviral therapy among HIV-positive people who use illicit opioids. Addiction 2015; 110:1330. L Sordo et al. Mortality risk during and after opioid substitution treatment: systematic review and meta-analysis of cohort studies. BMJ 2017; 357:j1550. RL Woosley and KA Romero. QT drugs list. Available at: www. crediblemeds.org. Accessed May 25, 2017. FDA. Information for healthcare professionals methadone hydrochloride text version. Available at: www.fda.gov. Accessed May 25, 2017. Inhibitors and inducers of CYP enzymes and p-glycoprotein. Med Lett Drugs Ther 2017. May 18 (epub). Available at: medicalletter.org/downloads/CYP_PGP_Tables.pdf. Accessed May 25, 2017. U.S. Government Publishing Office. 42 CFR 8.12 – Federal opioid treatment standards. Available at: www.gpo.gov. Accessed May 25, 2017. LE Baxter Sr et al. Safe methadone induction and stabilization: report of an expert panel. J Addict Med 2013; 7:377. Buprenorphine: an alternative to methadone. Med Lett Drugs Ther 2003; 45:13. 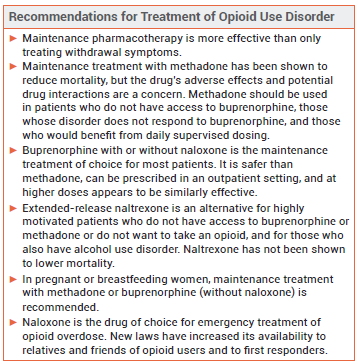 In brief: Buprenorphine/naloxone (Zubsolv) for opioid dependence. Med Lett Drugs Ther 2013; 55:83. Buprenorphine implants (Probuphine) for opioid dependence. Med Lett Drugs Ther 2016; 58:94. Substance Abuse and Mental Health Services Administration. Buprenorphine waiver management. 2017. Available at: www. samhsa.gov. Accessed May 25, 2017. RP Mattick et al. Buprenorphine maintenance versus placebo or methadone maintenance for opioid dependence. Cochrane Database Syst Rev 2014; 2:CD002207. TV Parran et al. Long-term outcomes of office-based buprenorphine/naloxone maintenance therapy. Drug Alcohol Depend 2010; 106:56. DP Kao et al. Arrhythmia associated with buprenorphine and methadone reported to the Food and Drug Administration. Addiction 2015; 110:1468. D Marteau et al. The relative risk of fatal poisoning by methadone or buprenorphine within the wider population of England and Wales. BMJ Open 2015; 5:e007629. DR Wesson and W Ling. The Clinical Opiate Withdrawal Scale (COWS). J Psychoactive Drugs 2003; 35:253. Naltrexone (Vivitrol) – a once-monthly injection for alcoholism. Med Lett Drugs Ther 2006; 48:62. E Krupitsky et al. Injectable extended-release naltrexone for opioid dependence: a double-blind, placebo-controlled, multicentre randomised trial. Lancet 2011; 377:1506. JD Lee et al. Extended-release naltrexone to prevent opioid relapse in criminal justice offenders. N Engl J Med 2016; 374:1232. S Minozzi et al. Oral naltrexone maintenance treatment for opioid dependence. Cochrane Database Syst Rev 2011; 4:CD001333. Y Adi et al. Oral naltrexone as a treatment for relapse prevention in formerly opioid-dependent drug users: a systematic review and economic evaluation. Health Technol Assess 2007; 11:iii. SD Comer et al. Depot naltrexone: long-lasting antagonism of the effects of heroin in humans. Psychopharmacology 2002; 159:351. M Ferri et al. Slow-release oral morphine as maintenance therapy for opioid dependence. Cochrane Database Syst Rev 2013; 6:CD009879. T Beck et al. Maintenance treatment for opioid dependence with slow-release oral morphine: a randomized cross-over, non-inferiority study versus methadone. Addiction 2014; 109:617. M Ferri et al. Heroin maintenance for chronic heroin-dependent individuals. Cochrane Database Syst Rev 2011; 12:CD003410. SY Lee et al. A placebo-controlled trial of dextromethorphan as an adjunct in opioid-dependent patients undergoing methadone maintenance treatment. Int J Neuropsychopharmacol 2015 February 25 (epub). DA Fiellin et al. A randomized trial of cognitive behavioral therapy in primary care-based buprenorphine. Am J Med 2013; 126:74. ACOG Committee on Health Care for Underserved Women and American Society of Addiction Medicine. ACOG committee opinion No. 524: opioid abuse, dependence, and addiction in pregnancy. Obstet Gynecol 2012; 119:1070. KA Saia et al. Caring for pregnant women with opioid use disorder in the USA: expanding and improving treatment. Curr Obstet Gynecol Rep 2016; 5:257. HE Jones et al. Neonatal abstinence syndrome after methadone or buprenorphine exposure. N Engl J Med 2010; 363:2320. SL Wiegand et al. 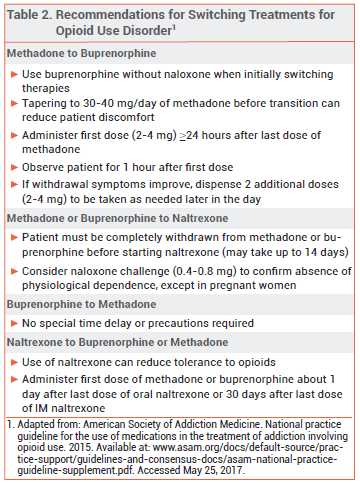 Buprenorphine and naloxone compared with methadone treatment in pregnancy. Obstet Gynecol 2015; 125:363. 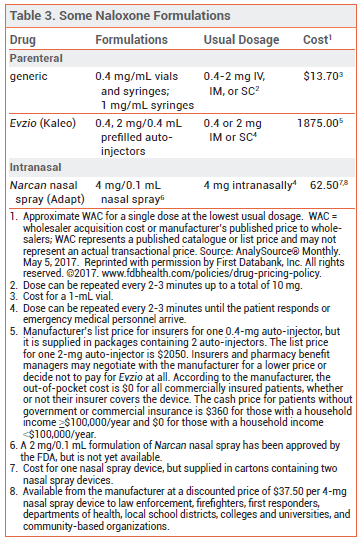 Naloxone (Narcan) nasal spray for opioid overdose. Med Lett Drugs Ther 2016; 58:1. American Psychiatric Association. Opioid use disorder: diagnostic criteria. Available at: https://pcssmat.org. Accessed February 15, 2018. JD Lee et al. Comparative effectiveness of extended-release naltrexone versus buprenorphine-naloxone for opioid relapse prevention (X:BOT): a multicentre, open-label, randomised controlled trial. Lancet 2018; 391:309.